I was looking at popular search phrases the other day and one popular keyword phrase (long-tail keyword) is “page one Google guaranteed.” Of course it is. Not only are people looking for someone to help them get to page one, but they also want it to be guaranteed. 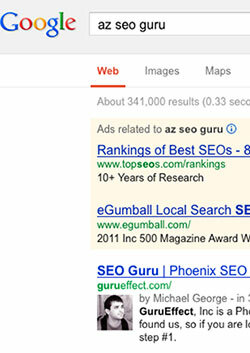 So How Do SEO Companies Guarantee Page One Results in Google? Well that’s really special, but who searches for that? What they delivered to you, and guaranteed, is essentially worthless. I have a friend who fell for this trick, unfortunately. They did make her number one in Google, all over the world, but guess what the phrase was? Yep, so the salesperson told her: “When people search, they will find you on page one of Google, guaranteed!” And then, with barely any work at all, the so-called SEO company made it happen. Then you can listen to them stutter and stammer. 2. They don’t put you in the organic results. This used to be very common, before people were savvy to Pay-Per-Click. There were many douche bags all over the internet advertising a “page one guarantee” and then, after you paid them, they actually had the chutzpah to simply set up a PPC campaign and then keep your deposit. Another method that companies like FindLaw (for lawyers) use is directory listings. So, let’s say for whatever your business is, there is a big directory. If you were a lawyer, it would be FindLaw; if you were a Realtor, maybe Zillow or Trulia. Then, the directory that’s already number one in Google? They just add you to it…and keep your deposit because now you are on page one of Google, just like they said. It’s all semantics. Yes, this is page one, but you don’t need an SEO guru to place ads. 3. They use black-hat techniques, or techniques that simply won’t last. For example, the power of the press release, for SEO purposes, has dropped significantly. I can still get certain press releases to page one of Google without a problem, but since Google recognizes this as “news,” it doesn’t last forever. Press releases seem to drop after just a day or two. Just like the press release won’t last forever, neither will black-hat techniques. Maybe they’ll get you to page one with a ton of bad-linking, and then when Penguin or another algorithm update comes, you’ll just drop fifty pages into obscurity. Of course, you already paid them like a sucker. You might even have to retire your domain name if they did enough damage. 4. The guarantee isn’t for page one, but just for a guaranteed increase in rankings. I visited an SEO company’s website the other day, and they proclaimed that their SEO was absolutely guaranteed. So, I took a closer look and they said that they would refund your money (and they were expensive), if they failed to move you up in the rankings- for your desired phrase- at least two positions. All of our clients get a guarantee, but it’s never “page one for anything you want”. The guarantee is different for each client. First, we analyze your current situation and your needs. There are some phrases that you simply cannot be number one in Google for. One example, right off the top of my head, would again be searches for the president or maybe searches related to Google itself. My name is Michael George and I can’t get myself on page one of Google for my own name. (Because of a more-famous guy named George Michael.) But if there is an SEO company out there that can get me to appear on page one for my own name (and nothing more); I’ll say that’s the best SEO company in the world. However, if you contact us, we will be honest- from the beginning- about what we can and cannot do for you. We do not work with Google. We have no control over the algorithm…but we can help you as much as possible, working within the Google webmaster guidelines.